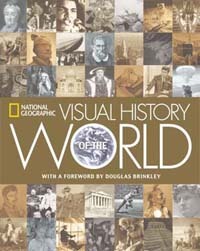 The world history book to define all others, National Geographic Visual History of the World is a classic in the making. No other volume offers such a comprehensive and richly illustrated chronicle of world events, from the construction of the Pyramids to the overthrow of the Taliban. Readers see how momentous happenings, personalities, catastrophes, discoveries, and inventions unfold in a visually stimulating layout. Four eight-page gatefolds bring to life major events of world history and thousands of paintings, photographs and illustrations depict subjects ranging from the Roman Empire to the Reformation, World War II, to the war in Afghanistan. A timeline at the bottom of every page highlights the most important events, names, and dates of the era, and color-coded cross-referencing helps point readers to other applicable sections. Ideal for people who prefer to flip through books at random, this highly accessible resource contains sidebars on the great religions, influential ideologies, and other topics, as well as biographies of world leaders and notable personalities in the arts and humanities.